Reaction to the launch of ReLIRE from writers and readers was strong this week, but publishers and the Bibliothèque National de France were rather quiet. François Gèze, director of the publishing house Editions La Découverte and member of the scientific committee established to oversee the ReLIRE registry left a long comment on Lionel Maurel’s blog, which led to a lively debate and prompted a new post, Réponses à François Gèze, membre du conseil scientifique du registre ReLIRE, (Response to François Gèze, member of the scientific committee of the ReLIRE registry, link in French) several days later. Clearly publishers and other actors behind ReLIRE were watching. 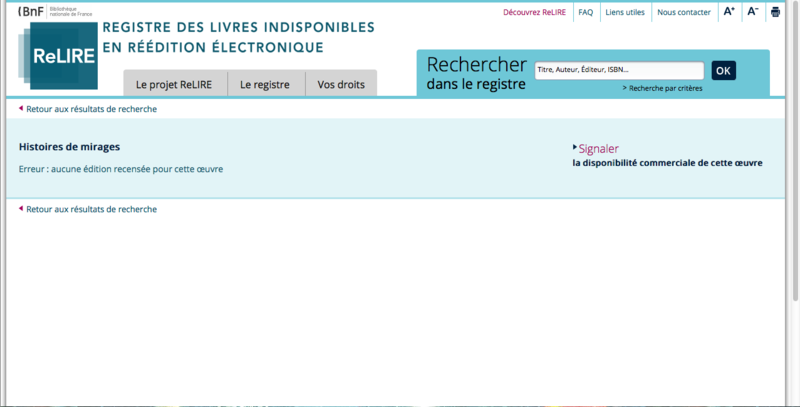 Today, by chance I noticed that two of the anthologies containing works of prominent foreign authors in translation had been quietly removed from ReLIRE. Update April 14, 2013:I learned from @JN_Squire on Twitter that De Sang et d’encre, including a story by Neil Gaiman has also now been removed from ReLIRE. As publisher editor, Léa Silhol opted out the whole book last week. Without a statement from the committee behind ReLIRE, it’s hard to know if these works have been removed from the registry because they were errors, or if the authors, translator or publisher concerned has submitted an opt-out. As a commenter pointed out on Lionel Maurel’s blog, the lack of transparency concerning the contents of the registry makes it difficult to know the status of a book on the list, for example whether it has been opposed, confirmed, etc. So it isn’t obvious why these works have now been removed. Just in case, I have also made snaps of several other anthologies that have been mentioned in various places but that haven’t yet been removed from the registry. It would be reassuring if the actors behind ReLIRE would come forward to explain what is going on. 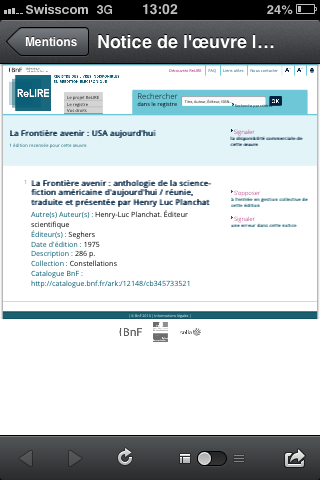 This entry was posted in Copyright, Digital Books, France and tagged funny business, ReLIRE. Bookmark the permalink. I will inquire further. Just for the sake of statistics, and in order to be sure that all the stories included are safe and sound. Hi Léa, Thanks for the correction; I’ve updated the text. I’ll be interested in hearing if you find out more about how the book came to be removed from ReLIRE. Thanks for coming back to leave a note about the notification you received after your anthology was removed from ReLIRE. Your post was interesting, especially the wording of the letter you received, and I hope that English-speaking readers will try Google or Bing Translate until you have the English version ready. A °little bit° more than ‘interesting’, imho. It’s the answer, plainly put. I uploaded the complete version of the blog this morning, after a checkpoint on some points of the “orphan books” Law. We are working on the English edit. 1 emergency among hundreds. I agree it is nice to know why these particular works were removed, however that the FAQ on the ReLIRE site has been discreetly modified does nothing to provide any reassurance and only perpetuates the lack of transparency in the process. I notice the FAQ also says that “French translations of text under copyright that was initially published outside France are also normally excluded from this first list” (emphasis and translation are mine). This is similar text to the letter you received and does seem to imply that there may be exceptions or that the policy may change at a future time. I do not consider the matter closed. – The blog doesn’t say that “it’s nice” – °all the contrary°, absolutely. And it certainly doesn’t say that the “matter is settled”, °all the contrary°, bis rep.
– The parts that you are stressing were °already° under heavy emphasis into Léa Silhol’s blog. – All the questions that you address were °already° addressed by LS in her blog. It’s, plainly put, the topic of the whole blog. wording of the 2 pieces that Lea analyzed are °not° the same, by the way, but they complete each other and help to outline the pattern. *** It’s in the FAQ, and in LS’s blog: the writer’s or their friends will have to send an “error” notice though the online platform or these books will be victims of the same fate than the other books that shouldn’t be there. *** LS’ point of view about that is in the blog, and her advice not to fall prey to this false security, and to prefer the “opt out option” to the “error notice”. LS is talking about this right now with her partners within the UK and America Author’s Societies, and will certainly publish their conclusions afterward, in the usual places. You’ll check this if you’re still interested by this topic. I really think that you missed something in the blog. Thanks for your comment. Yes, we read the same blog and no, I did not miss any of what you mention. Either I did not explain my comment well enough or the context of it was not clear. I understood “it’s the answer” in Léa’s comment to mean the question is settled, the matter is closed. I was confused that she said this because to me, the matter is not at all closed, for the reasons clearly mentioned in the blog, and which you repeat again here, and which I certainly did not miss when I read it. So I agree with you completely. When I said “it’s nice to know” I meant that I was glad to learn the reason that De Sang et d’Encre was removed from ReLIRE, not that I thought everyone was happy about it. P.S. Sorry, I just realized that the comment in question (“it’s the answer”) was yours and not Léa’s. I hope this doesn’t add to the confusion.